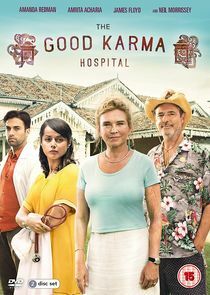 Set in the tropical paradise of Goa, The Good Karma Hospital is a drama with heart. Vibrant and colourful, the contemporary series follows a team of British and Indian medics as they cope with work, life and love at an over-worked and under-resourced cottage hospital. Run by a gloriously eccentric Englishwoman, the "Good Karma" turns no one away - locals, ex-pats and tourists are all welcomed through its doors. With a stunning location, exotic medical cases and unforgettable characters, the series mixes the heartbreaking with the humorous, as the doctors, nurses and patients discover that the hospital is more than just a rundown medical outpost - it's a home.